Long before it was a Cat-Tale, it was a corporate entity with a myriad of crimefighting uses. Chris Dee provides a quick review of the company and it’s many incarnations since it’s creation in Book 5: Not My Kink. The decorations are just going up in the Cat-Tales Virtual Visitor Center. A few photos posted to whet everyone’s appetite. This Gotham is due for a refurbishment in 2013, so this is the last year it will be looking this way. A much smaller tree at the Cat-Tales Visitor Center itself. Do we really need a second tree? Probably not, but it pisses off Poison Ivy, so why not. 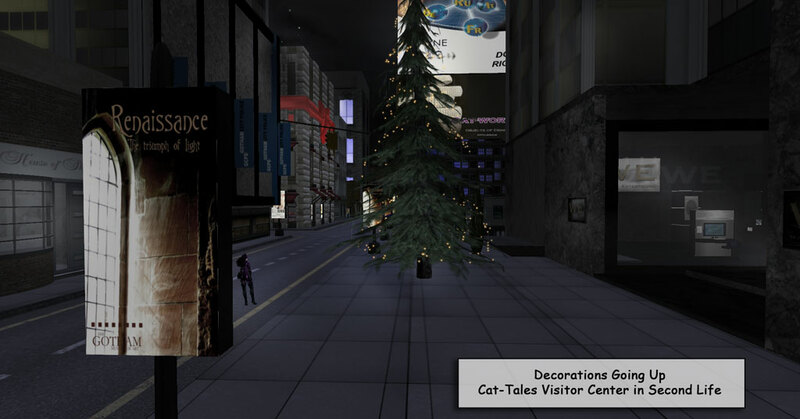 You can visit the Cat-Tales Virtual Visitor Center and learn more about Chris Dee’s Cat-Tales in Second Life. 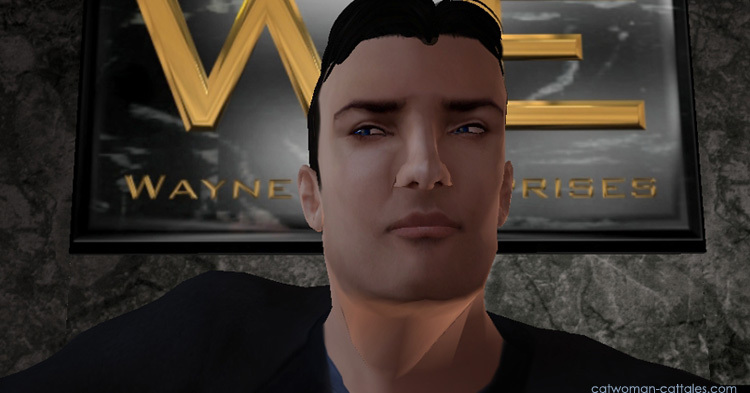 Bruce Wayne in the Wayne Enterprises lobby. 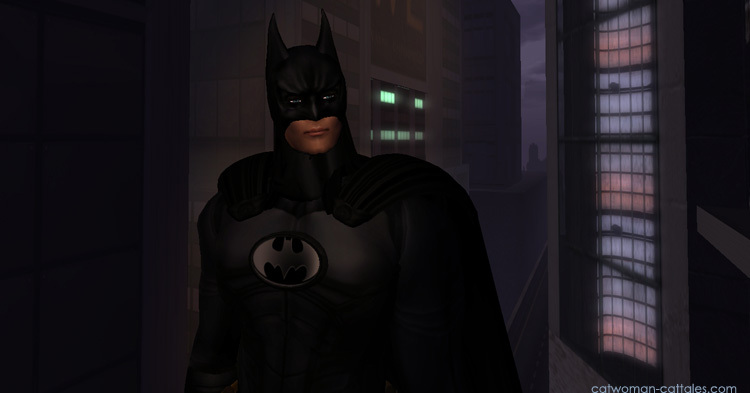 It’s today’s Gallery spotlight because it’s Bruce and not Batman–and the intrigue around Wayne Enterprises and the Foundation which is at the focus of the current tale Wayne Rises. The only downside to presenting a Dark Knight character portrait is The Dark Thumbnail. This is a beautiful piece, the Cat-Tales Batman, right down to the lip twitch, posed in front of Wayne Enterprises, beautiful coloring on -grunt- My City -grunt-. But the detail just doesn’t come through. You simply have to click through and see it full size in the Cat-Tales gallery. One way to look at this is Selina having a busy night with two – count ‘em two – world class break ins that no other thief in the world could pull off. And Occupy Gotham and the Anonymous hackers entrenched there, etc., etc. Let’s just say it’s an episode with some seismic implications in the latest update at Gotham After Dark. I’m not saying there is a definite connection here, I don’t claim to be a criminologist. But a Mr. Jason Thalappille at the Gotham Observer recently ran a story about the slew of burglaries plaguing Gotham City, and this line just happened to pop out at me how so many of the victims seem to be hit when they’re not at home because they’re out attending Wayne-related events. And at virtually the same time the Citizens Against Batman operating at Gotham After Dark saw, well, a catwoman-shape on the horizon. The voting went to follow HER story, and this morning, we see that she is breaking into Wayne Enterprises! Criminology-minded readers, am I crazy? Am I imagining this?